Organic seed sprouts: alfalfa, chinese garlic, broccoli, onions, cabbage, fennel, lentils, mustard, horseradish, soy and wheat. - Extertronic, S.L. Sprouts Organic Seeds There are 18 products. 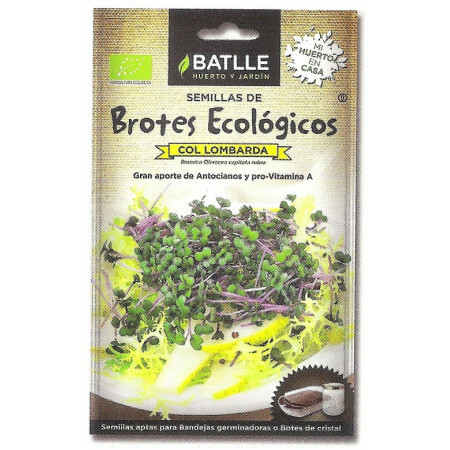 White Mustard Sprouts Organic, natural remedy for colds and fever. Acts as a muscle pain reliever. Stimulate blood circulation. 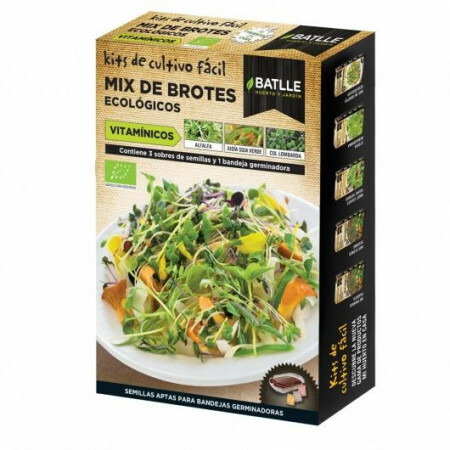 Mix Organic sprouts Vitality blend of five different types of green sprouts. Ideal for salads and main courses. Blend that provide energy and nutrients. 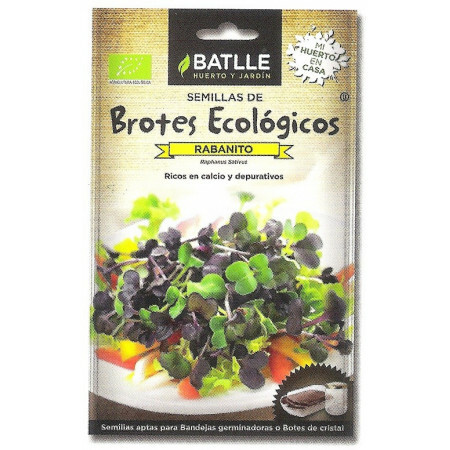 Organic Radish Sprouts, enhance the view and strengthen muscle tissue. Increases immunity and has antiseptic action. Contine very few calories. Organic Arugula sprouts rich in vitamins A and C and minerals like calcium and iron. 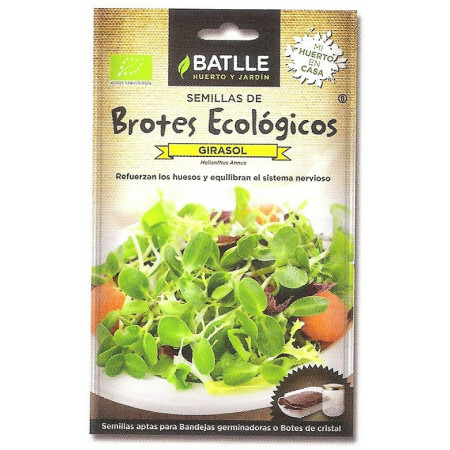 They are used in pastas and salads. Diuretic and emollient properties. 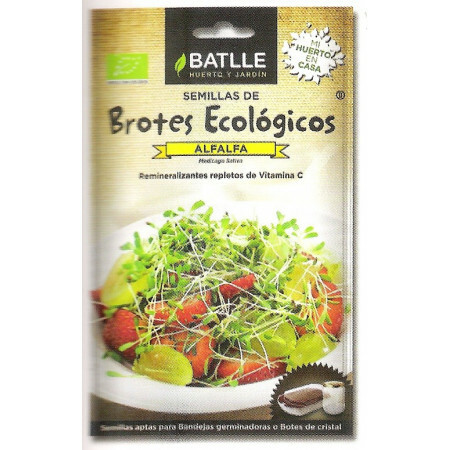 Organic sprouts Wheat, large supply of vitamins, proteins, minerals and carbohydrates. Provide elasticity to tissues, hair and nails. Idelaes for slimming diets. 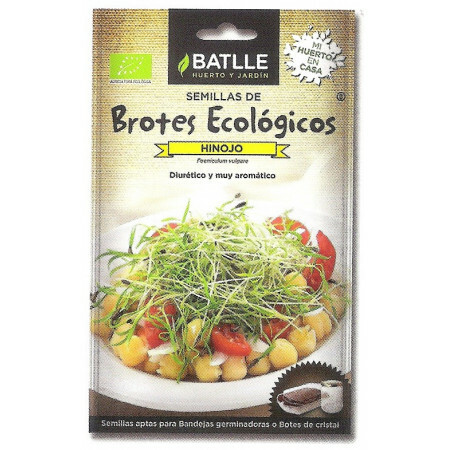 Organic Green Soya Sprouts - Mung Bean, ideal for lowering cholesterol and blood pressure. Protíná rich in vitamins and minerals. High fiber supply. Organic Alfalfa Sprouts that provide plenty of vitamin C, are very tonics that help eliminate toxins and also have diuretic properties. 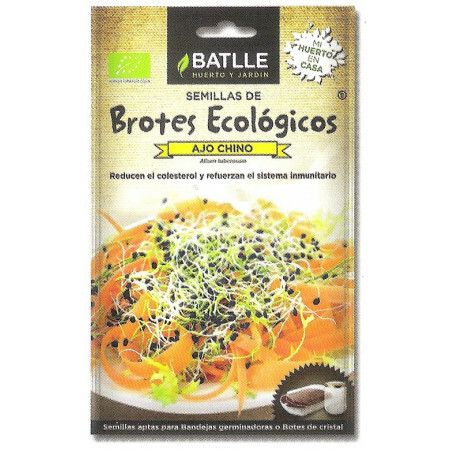 Organic sprouts Lentils, help control blood sugar levels and cholesterol. They are usually steamed or sauteed concinar in the pan. High fiber and iron. 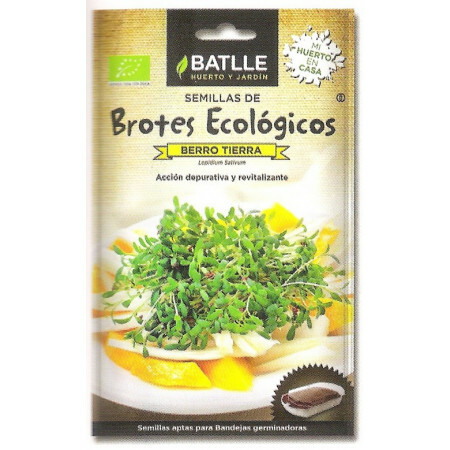 Green sprouts Soil Watercress is a remedy for anemia, bronchitis and rheumatism, is also diuretic and acts against nicotine. It has a slightly spicy aroma. Organic Garlic Sprouts Chinese that help lower cholesterol, strengthen the immune system and can be used as laxatives and diuretics. 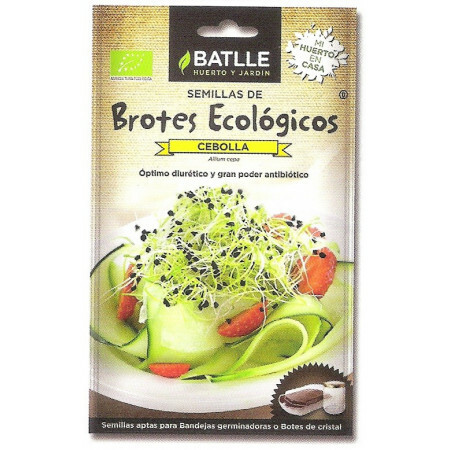 Organic sprouts Fennel, help eliminate excess fluids and body fat. 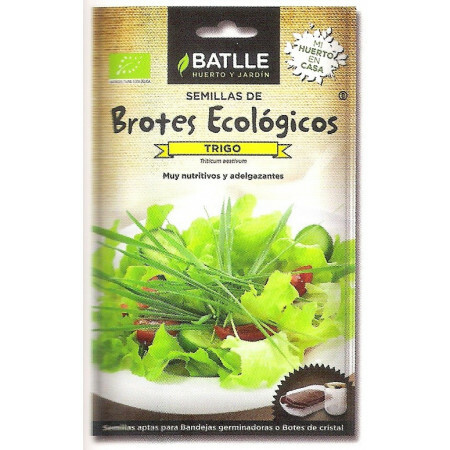 Widely used for preparing meat, fish and salads. Aromatic and mellow taste. 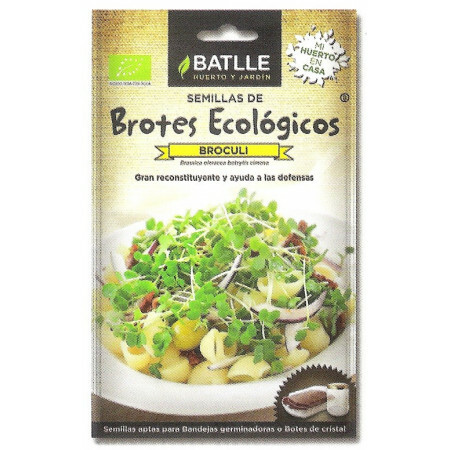 Organic Broccoli sprouts are good for strengthening the defenses and as recostituyentes. Ideal as an accompaniment. They tangy flavor. Green onion sprouts have purifying effects, antibiotics and diuretics. Rich in nutrients for cell growth. Ideal for soups, omelets, etc. Organic sunflower sprouts, indicated to relieve muscle aches and balance the nervous system. Idea for slimming diets for its high nutrient content. Strengthen bones and teeth. Green sprouts Red Cabbage with properties that help the immune system. They provide lots of vitamins and minerals. Ideal as an accompaniment to appetizers, salads and other dishes. 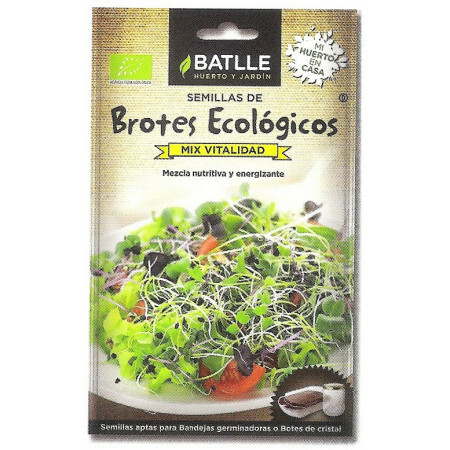 Mix Organic Sprouting Sprouts Energy. Three envelopes of various seeds: Alfalfa, Lombardy cabbage and Green soybeans. Includes germinating tray. 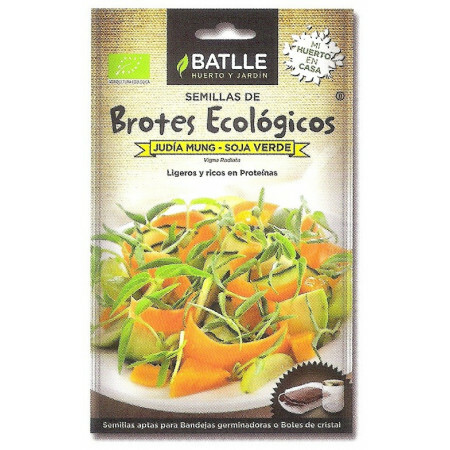 It is the easiest and funniest way to get started in growing sprouts in our private home. 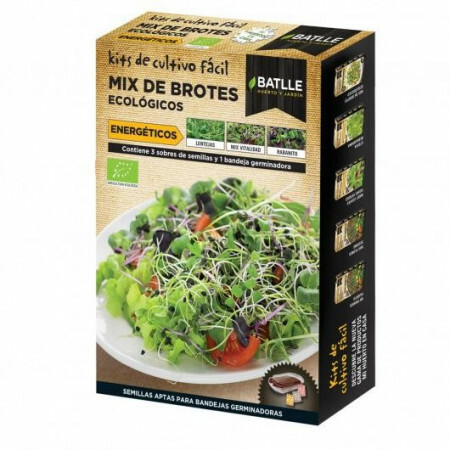 Mix Organic Sprouting Sprouts Energy. Three envelopes of various seeds: lentils, Mix vitality and Radish. Includes germinating tray. 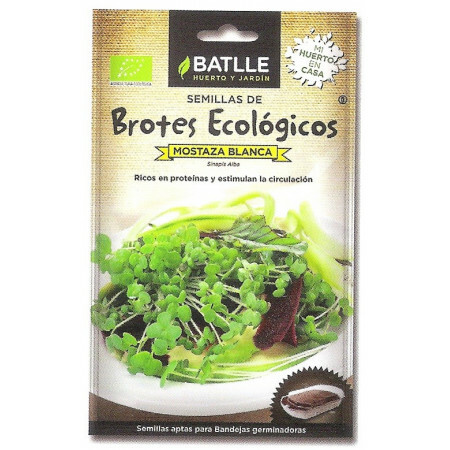 It is the easiest and funniest way to get started in growing sprouts in our private home.